BAKU, Azerbaijan, (BulgarianMilitary.com) – Last month, the capital of Azerbaijan, Baku, hosted for the third time, the Azerbaijan International Defense Exhibition, ADEX 2018. 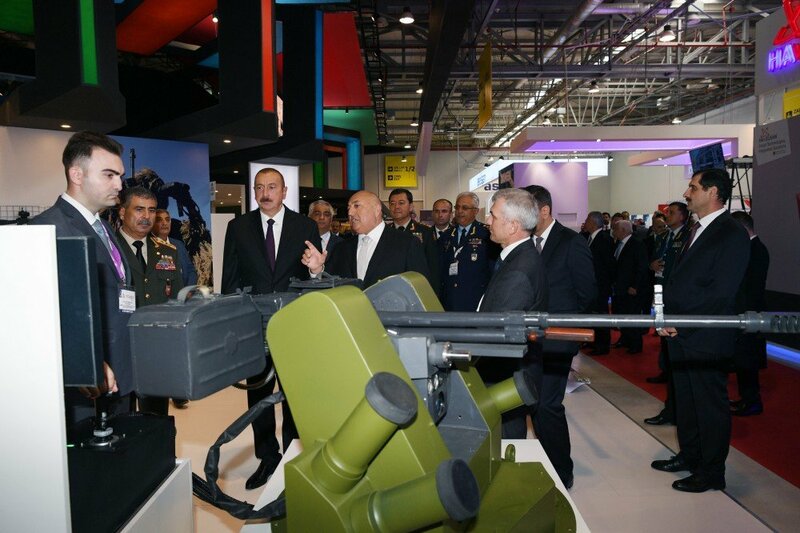 The third large-scale exposition of military equipment and armament in the region was held in the period from 25th to the 27th September at Baku Expo Centre, learned BulgarianMilitary.com. The local event, supported by Ministry of Defence of the Republic of Azerbaijan, is organized by the Ministry of the Defense Industry of Azerbaijan. The exposition originator also actively participated in it along with local defense enterprises and organizations, with the aim to demonstrate the Azerbaijani defense industry strength and the enhancing capabilities of the Armed Forces of Azerbaijan. ADEX 2018 was visited by President of the Republic of Azerbaijan, Ilham Aliyev. Alongside with the local groups, this year’s exhibition in Baku was attended by representatives from 44 countries, such as Azerbaijan, Turkey, China, Russia, Israel, Iran, Belarus, Serbia, Ukraine, Pakistan, France, etc. Altogether, 224 companies from 29 countries, including some of the world famous corporations as MIG, TUSA, Leonardo, UAC, Motor Sich, Russian Helicopters, the Aeronautics Group and others, took part in ADEX 2018. Unlike the previous years, this time, the Azerbaijani military exposition was visited by much more high-level official delegations, in particular 34 from 23 countries, with Egypt, Kazakhstan, Ghana, Saudi Arabia and Montenegro sent delegations to ADEX for a first year. The schedule of the exhibition also provided opportunities for discussing and negotiating on prospect bilateral military-technical cooperation between the heads of foreign delegations and the representatives of the local agencies and departments. During ADEX 2018, the stands of the participants displayed developments in areas including air and missile defense, military shipbuilding, weapons systems, military research, UAV systems, small arms, ammunition, missile and artillery equipment and armament, MLRS, optoelectronic and laser technology, armoured vehicles, submarines, C4ISR systems, etc. Furthermore, this was the first time when the Service Сentre for Maintenance and Repair of Armored Vehicles was presented. Some of the spotlights of the exposition included: ATMOS M-46 130 mm truck-mounted howitzer and SPEAR mortar mounted on BTR-70 armored vehicle, both developed by the Israeli company, Elbit Systems; the Yasir UAV and Bina tactical UAV by Iran’s Qods Aviation Industries; Bogomol and Centaur UGVs developed by the Belarusian company BSVT; Tigr 4×4 light armored vehicle, presented by the Russian vehicle manufacturer Military Industrial Company (VPK); artillery and main battle tanks by the Russian concern Techmash and the local Tufan 4×4 MRAP vehicle developed by the Azerbaijani Ministry of Defense Industry (MODIAR), etc.